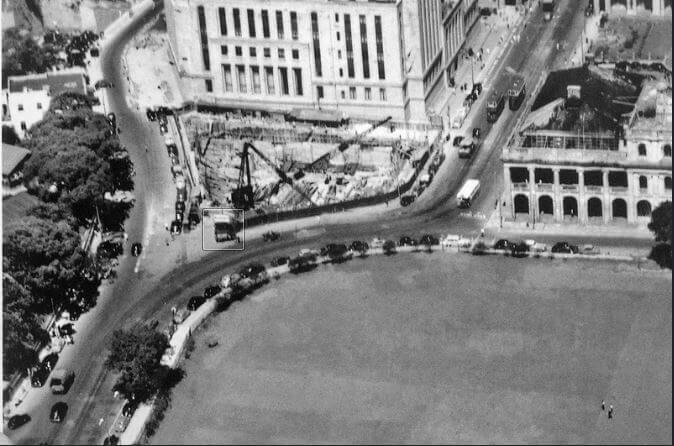 Ian Wolfe: The second photo shows construction of the basement of the Old Bank of China in progress with a Scotch [also known as a stiff-leg] derrick as the only means of rigging heavy steel sections, which was required for the excavation and lateral suppport (ESL) work when this was getting deeper. Scotch derricks were common in the old days when tower cranes were not popular, this type of crane can be found in local dockyards, casting yards and container handling yards as late as in mid-80s. Jointing of the last bridge segement at mid-span of Ting Kau Bridge made use of Scotch derricks, imported from Britain as second-hand equipment. Four were operated simutaneously to get the job done, probably the last time Scotch derricks were used in Hong Kong. Elsewhere in Bangkok, Taipei and Tokyo, Scotch derricks with modern safety devices and control consoles can still be seen, thanks to the popularity of building highrise structural framing that made use of steel sections. The major shortcoming is that Scotch derricks can only slew 270 degrees maximum, it is forbidden to install a derrick boom within the quardrant between two raking struts. 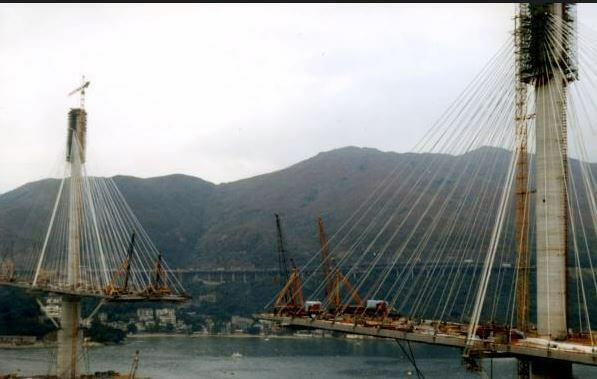 As far as I am aware, the last time Scotch derricks were deployed on a construction site in Hong Kong was when the Ting Kau Bridge was being built. 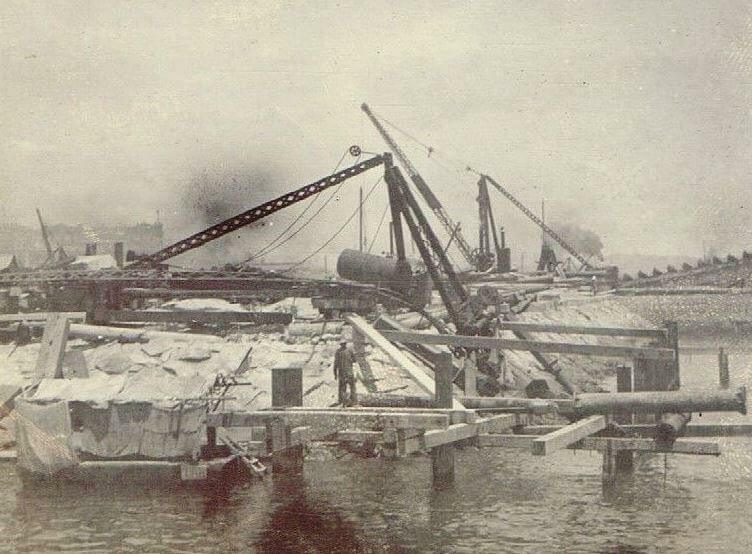 The last bridge segments were lifted from barges and had to be installed by four Scotch derricks in order to join the bridge sections together. These were old second hand cranes from Britain probably scrapped from shipyards etc. Ian adds: The Admiralty C1900 image was believed to be an accident investigation record photo. The derrick at the front had collapsed probably due to overloading or misuse ! “The stiff-leg derrick is one equipped with a vertical mast that is shorter than the boom. This support member is tied into the framework of other members, which are the angling legs extending from the peak of the mast toward the boom to form a triangle with the mast’s base at the bottom frame level. This derrick is a piece of erection equipment to consider where there is a strong base level to support the entire horizontal under-frame. It may be used on level ground, a boat deck, or the more-or-less horizontal chord members of a bridge. In the latter case the derrick’s width between the bottom of the angling support legs would have to equal the bridge width between trusses with a cross member equal to that width. A stiff-leg derrick could also be used for higher lifts by having it supported at a higher level on a triangular tower with vertical legs under the mast and bases of the angling support legs. This would be called a tower derrick. 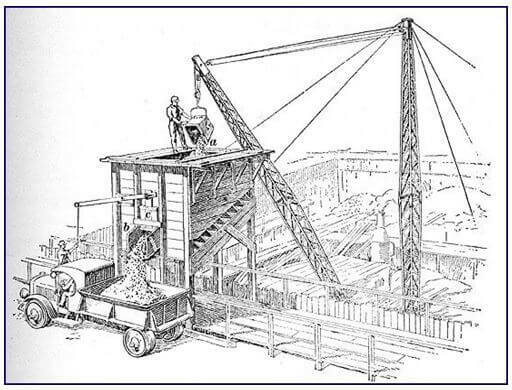 Generally, the whole supporting frame for the derrick is moved on rollers by winching under its own power along beams or rails, but not when it is hoisting a load. In order to avoid taking too much area at the base level and to keep the supporting legs relatively short, it will be necessary to use counterweights or ballast on the base frame around the mast bottom of the stiff-leg derrick. This is somewhat similar to the arrangement for a mobile crane. It is done to avoid negative reaction under the mast that would indicate the derrick is about to tip over in the direction of its boom. This article was first posted on 5th October 2016.